NetBet started out in 2001 under a Maltese gaming license. The business owners are Mandaplay Limited and Cosmo Gaming Company Limited Casinos, with a location in London. The website originally started as a casino, primarily catering to English and French-speaking countries. However, now the company strives to service many more European countries than before. 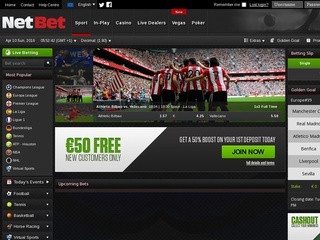 NetBet’s sportsbook has grown considerably in the last few years. From just a few sports, they upgraded to the current number of twenty-nine. And, while the bookmaker was known for the extensive casino games selection, NetBet has become a betting force up to par with the majority of bookmakers. The website is using an amazing platform and in the result, it is very easy and intuitive to use. NetBet is currently on the 49813 spot of most visited websites in the world and top 3000 in Germany. The majority of visitors are from Germany, the Netherlands, Japan, and the United Kingdom. It is still not ranking among the best names in the gambling industry, but will surely pick up in the upcoming years. With great offers on sports and casino games the stats show that the website is gathering popularity very fast! NetBet currently offers twenty-nine different sports to choose! Tennis, football, basketball, horse racing, virtual sports, handball, ice hockey, baseball, American football, rugby league, snooker and pool, golf, darts, motor racing, poker, cycling, volleyball, speedway, winter sports, boxing, badminton, rugby union, Aussie rules, Bandy, cricket, mixed martial arts, surfing and E-sports complete the full list. One of the major pluses of this online bookie is the availability to bet on e-sports. Not many websites offer this feature yet and, as the virtual games are becoming more and more popular, with millions of viewers and fans throughout the world, the bookmakers who fill this niche will swipe a big portion of the new customers. A live betting option is available with some exquisite odds to win, too. The casino section boasts an enormous collection of games. There are various types of slots, roulette games, video poker, blackjack and jackpot games. European Roulette, Starburst, Ariana and Diamond Wild are the community top choices. NetBet also is packed with a selection of games with live dealers. Automatic and live roulette, blackjack, baccarat, live casino hold’em and live three card poker. Those are available in real time, with real people! The website also has a section called Vegas. It has some of the best games from the Vegas casinos and now you can enjoy them on-line. Now, the poker section is something else. Aside from the usual tables, NetBet’s poker hosts occasional tournaments and gives players a constant stream of promotions. The Vip Club is there for the best players. The software is downloadable, sadly, but that makes it even more secure. There is even an Academy where both new and more experienced players can hone their skills and start cashing in the winnings. NetBet offers some great odds to their betters. There is a ton of options to bet. Aside from the usual ones, there is Asian handicap, total goals, team goals, teams odd/even, draw no bet, last to score, both teams to score, 1st to score, 1st and second half options, exact score, teams clean sheet, teams to score in 1st/2nd half and much more. Of course, the highest odds are given for correct score in the first half, exact score, the Asian handicap options and the number of team goals in the first half. In conclusion, players have a vast selection of games with an even bigger choice of odds to bet. The overall betting margin is 5.3%, with an affinity towards ice hockey with 9.2%. The minimum Bet is limited to 0.25 EUR; the maximum has no limit, and the maximum winnings are set to 20000 EUR per bet and 50000 EUR per week. High rollers might not like this limit, but it is great for recreational and lower steaks players. NetBet’s website handles absolutely every request through an SSL encrypted connection. Most sites choose to do this only on the deposit/withdrawal pages, but NetBet is one of the few who likes everything to be secure. This measure can prevent unwanted account and identity theft. The customer service center is available 24 hours every day, so you can contact the bookie with questions and issues whenever you deem fit. A friendly, professional executive will be waiting on the other side, eager to help you with your problem. You can contact NetBet through e-mail, telephone and live chat. The website offers a view in several languages – English, Spanish, French, German, Greek, Romanian, and Russian. The options for making a deposit in your NetBet account are many. As most online bookmakers, this one accepts most money transferring methods.You can use a wide variety of currencies. The NetBet bookmaker offers a cornucopia of bonuses for new players. A 50% deposit bonus, up to 50 EUR is available to new customers. As far as crediting goes, it has to be rolled at least once with odds higher than 1.60. The bonus code is WELCOME50. On the other hand, some countries are unlucky and have to roll over the deposit bonus five times, before they can withdraw it. The Roll-over is not the best, but it is still a bonus. The other gifts are available in the casino. The deposit bonus players get a 100% extra, up to 200 EUR, bonus code NBWELCOME. Poker offers are quite a lot and change often, so we are not going to cover that. Go and see them for yourself, they are worth the look!